Just a little tribute to a friend with a moral thrown in. That’s not a mushroom, is it? 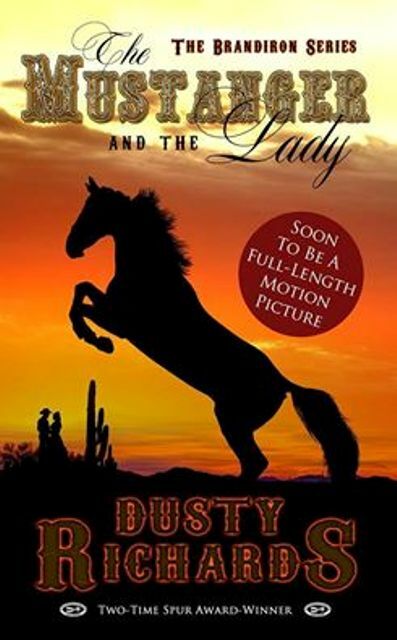 Awhile back I went to Dusty Richards little stampede shindig celebrating Saddlebag Dispatches and his latest novel making it to the big screen. It was a fun affair and I got to meet some new authors I’d not seen before. At the end of the evening, a raffle was held and I was fortunate to win a couple of items autographed by Dusty. One was a hard-bound copy of his new book, soon to be a movie, The Mustanger and The Lady. The other item was a damned big hat. Now, I’ve been wanting a cowboy hat. I know, I ain’t that kind of cowboy, but since I write in the western genre, it just seems appropriate. So, I tried it on and it was way too big. I mean settle down over your ears too big. When I joked with Dusty about it, he just laughed and told me to pad the lining with newspaper and it would fit perfectly. I brought all my loot home and put the prizes in my office. Mustanger is propped up next to the first edition of Saddlebags. The hat is hanging on a gun rack along with a 1934 Winchester Targetmaster .22, and a 1907 Stephens 12 ga. Pump. I figure it’s in good company. No matter how many times I try on that hat, it’s always too big. I can wear it around the office, when no one is looking, and pretend a little but it’s no use. It’s just make believe. Of course, that’s the moral of this little story. That genuine beaver quality Cavender’s Rodeo King is Dusty’s. It’s never going to fit because it’s not mine. I can never fill Dusty’s hat, because I’ll never be Dusty. So, I keep it hanging there as a reminder. It’s a damned big hat and full of lots of stories. I’d love to hear them all sometime. But, I gotta get to work filling my own hat. True story. I’m sitting in a crowded room at the Ozarks Creative Writer’s conference. It’s a big deal symposium full of accomplished authors and wannabe’s. Dusty Richards and Brett Cogburn were guest speakers and stroll up to the front of the dais. You could have heard a pin drop. Dusty announces they are supposed to give advice on writing. He looks around and says, “Write the damned story.” Looking at Brett, he asked. “That about right?” Brett nods and says, “that’s right.” Everyone was kind of shocked at the abruptness of it. I wish I could have seen the organizer’s face, expecting a full forty minutes of back and forth dialogue between the authors and the audience. Well, they did go ahead and have that discussion, but it all boiled down to that line he opened with. Their advice holds true for everyone, no matter what your vocation in life is. ​Write your story. Don’t sweat the small stuff. Edit later. Dusty is gone from us now. He and Pat left us doing what they wanted to do. Knowing Dusty, I know he left with the legacy he wanted. You could see it in his eyes when he laid all his books out on a table, and he'd tell you a story about every one. He was mighty pleased about the movie--like to popped his buttons when he told me about it. His hat will always be too big for the rest of us.